Today, a fellow Idaho Author, Jane Munro, tells us why she is a mystery writer. See her bio and more about her books below. Read and review to support local Idaho authors! Why am I a Mystery Writer? Anybody who’s already a writer knows the answer to that question. There are probably as many answers as there are writers. As for the genre…I write what I love to read. I’ve always loved mysteries, starting with Nancy Drew, Trixie Belden, and the Hardy Boys. Then I graduated to Agatha Christie, Ngaio Marsh, and Dorothy Sayers. I know, I’m dating myself here. Now there’s Sue Grafton, Sara Paretsky, Kathy Reichs, Patricia Cornwell. People always compare me to that other pathologist who writes, now what’s her name? I say I don’t know, because I don’t know of any other mystery series written by a pathologist. But I know they’re thinking of Patricia Cornwell, who isn’t a pathologist, but a reporter. I suspect that Kay Scarpetta is based on Marcella Fierro, the real chief medical examiner in Richmond VA.
What I want is for those people to be thinking of me when they ask that question. I can’t say exactly when I started wanting to write. I imagine I thought it would be something to keep me busy after I retired. Doctors have a way of working well into their seventies, and then when they retire they die. I don’t want to work into my seventies, and I don’t want to die, either. I didn’t actually start writing until my husband gave me a word processor in 1992. 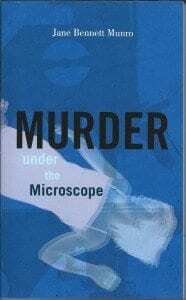 I started writing Murder Under the Microscope then. I finished it in 2002, and sent it to an agent I had met at Murder in the Grove in Boise that year. She liked it, but said she couldn’t sell it. She said it needed a subplot. So I put in a subplot (Robbie) and sent it back. No dice. She chewed me out for making Toni such a wimp. So I fixed that and sent it back. Still no dice. I gave up. In 2007, I had been divorced for 3 years and was introduced to a gentleman with whom I’m still keeping company today. He nagged me unmercifully until I went online, picked a publisher by the close-your-eyes -and-point method, and sent them Murder Under the Microscope. And here we are. There are now 3 Toni Day mysteries out there, one more in the final stages of publication, and a 5th one in the works. I’m addicted. I never travel without my laptop. I look at every adventure as a possible plot for a mystery. The sixth Toni Day mystery may very well take place on a cruise ship. Friends are always giving me suggestions for plots. My 4th book is called Death by Autopsy because my BFF said I had to write a book with that title, and I had to come up with a plot that fits it. It was a challenge, but I did it. Then I had to edit it, and that completely changed the second half of the book. I’m hoping to have it out in about a month. Now I’m going through the same struggle with the next book. I have an idea for a story. I know who’s going to get murdered, but not who the murderer will be. That will become clear as I write. I hope. And that’s why I write mysteries. Jane Bennett Munro, M.D., is a hospital based pathologist who has been involved in forensic cases during the course of her thirty-five year career. 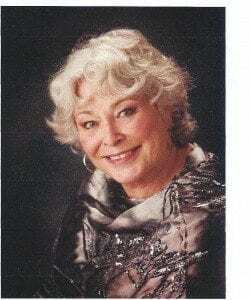 She also spent 8 years on the Idaho State Board of Medicine and was chairman 1997-1999. Now semi-retired, she lives in Twin Falls, Idaho, where she enjoys music, gardening, scuba diving, and skiing. 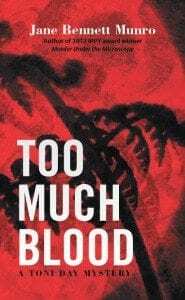 She is the author of Murder Under the Microscope, winner of an IPPY Award, and Too Much Blood. A new administrator is hired to ease the transition when overcrowded and landlocked Perrine Memorial Hospital is bought out by a behemoth hospital system that covers much of the Pacific Northwest and promises to build a new hospital in Twin Falls. But Marcus Manning, a good ole boy with roots in Twin Falls, far from making anything easier, manages to earn the enmity of medical staff and employees alike as he ruthlessly goes about eliminating anyone who might oppose him in his quest to become not only CEO of Perrine Memorial, but CEO of the entire system. 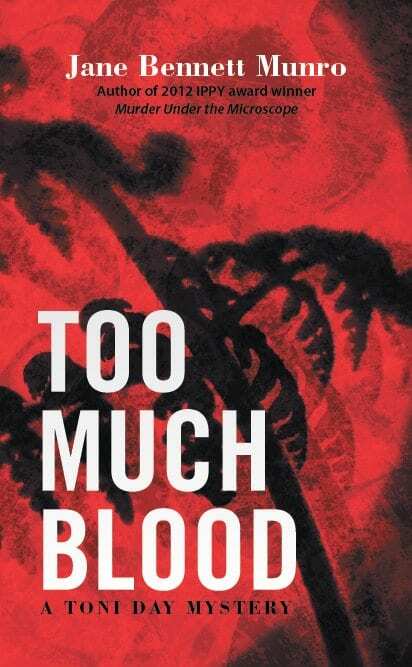 Unwisely, he starts his campaign with pathologist Toni Day, who blows the whistle on Marcus’s twisted campaign of lies, blackmail and sexual abuse until the medical staff finally considers firing him, but is saved the trouble by someone with a more permanent solution … of cyanide. Toni, as one of the prime suspects, is forced to solve the mystery of Marcus’s murder to keep herself out of jail, and as she delves further into the private lives of those involved in Marcus’s life, finds herself forced to kill in order to save her life and finally learn the truth. Dr. Antoinette Day, a young and successful pathologist in a small rural hospital, had no idea what she was in for when a beautiful female general surgeon came to the hospital to fill in for a colleague recovering from a heart attack. The newcomer makes Toni’s life a living hell while taking every opportunity to discredit her with her other medical colleagues. When the surgeon is conveniently murdered, Toni is the obvious suspect, especially since the body is found in her office. Now Toni finds herself in the position of having to solve the murder to keep from being convicted of it herself. The last thing she needs is to have a former boyfriend show up and start stalking her and threatening her husband. Stubbornly, Toni continues to delve into the mysteries surrounding the deceased and soon finds that it’s not just her freedom that’s at stake, but her life.